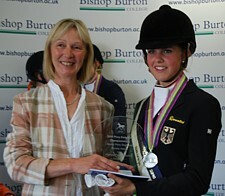 Pony European Championships 2010 - SPSS BLOG!! 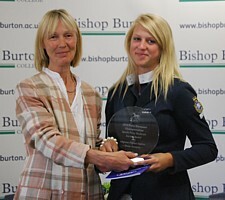 The 2010 Pony European Championships were held in the UK at Bishop Burton College, near Beverley, East Yorkshire from 27th July to 1st August. To support the event the SPSS sponsored a Cross Country fence and awarded trophies to the highest placed Stallion, Mare and British bred pony in each discipline. Full information about the trophies is given here. A review of the breeding of the ponies at the Championships was published in the 2011 SPSS Year Book. It can also be downloaded here. 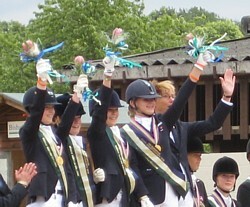 The first of the team medals to be awarded was for Dressage. Previously, the team Gold medal had been won by Germany for over 20 years, although more recently, the Netherlands had provided a strong challenge and this was to be their year. With good performances from 3 of their team, the Netherlands finished just ahead of Germany and were ecstatic to take the Gold. The British team were in contention for the Bronze medal, following a good performance from 12 year old Erin Williams, but uncharacteristic mistakes by the normally strongest combination in the team allowed the Danish team to go ahead (by less than 4 points) and Great Britain had to settle for 4th place. 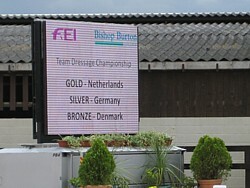 The final dressage medals were given for the Kur. Now down to the top 15 combinations, the same riders were on the podium but in different places. British combination Claire Gallimore and Gigolo (by Going East) recovered from their below par team test to mount a good challenge for the individual places finishing 5th in both individual classes. An excellent result against strong opposition. The SPSS Mare Trophy was awarded to Kur Gold Medallist, Golden Girl, an 8 year old DRP (Westfalen Studbook) by FS Don’t Worry out of Golden Dream (by Dancer). Together with Antoinette te Riele, they were key members of the Netherlands’ Gold medal winning team and Individual Silver medallists before winning the Kur Gold. The SPSS Stallion Trophy went to Deinhard B, an 11 year old DRP (Rheinland Studbook), Deinhard B is also by the successful sire Dornik B out of Gwenduline B (by Golden Dancer). 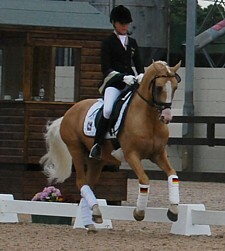 Ridden by Lena Charlott Walterscheidt for Germany, Deinhard B was one of the four palomino ponies in the Silver medal winning Team. Deinhard B then won the Individual Bronze medal and the Kur Silver medal and was the highest placed stallion in the Kur, thus receiving the SPSS trophy. Sadly, there were no British bred ponies actually competing in this discipline so the British team reserve, Fijal Figaro, was awarded that trophy. Figaro, a 14 year old New Forest gelding by Peveril Peter Piper out of Woodfidley Soft Music, was bred by Barbara Stiles. Figaro and rider Harriette Williams (age 13) competed internationally for GB in 2010 at Moorsele and Compiegne CDI-PJYR competitions. The second team medal to be awarded was for Jumping. In contrast to the single round format of the Dressage, the Jumping team medal was decided over 2 rounds and consistent form was required. Despite good efforts by the British team members they finished out of the medals in 5th place. The top 31 riders then went forward to the last individual rounds and this included all four of the British team riders. Thirteen year old Amy Inglis and Nils d’Hurl Vent, a French part bred Arab gelding by Quick Star out of Hera d’Hurlevent (by Boogie de la Gere), produced a double clear to finish as best British rider in 4th place. The top mare was Acapella Z, a 13 year old bay by Alcamera La Silla out of Renata La Silla (by Ramiro Z), born in Belgium and registered with the Zangersheide studbook. Acapella was ridden by Bertram Allen and, as well leading Ireland to a Team Silver medal, they were Individual Gold Medallists. Bertram and Acapella led the competition from the start by being the fastest clear in the Individual Jumping qualifying round and they completed the entire jumping competition with no jumping or time faults - the only combination to do so and a fantastic achievement. Best British bred pony was Aroldo, a 13 year old grey gelding by Verdi (Holsteiner and Grade A Showjumper) out of Megan’s Gift (Welsh Sec D), bred by Emma Harrison. 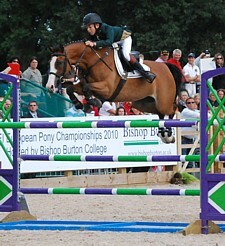 Aroldo was ridden by Emily Roe (age 13) from Lincoln and they were part of the British team. Emily and Aroldo were the second highest placed British combination in the Individual competition, finishing a creditable 16th. Aroldo was on the 2006 European Gold medal winning team with Emily’s sister Rebecca. The stallion trophy winner was Idefix du Villon, a 14 year old grey French-bred Connemara by Quignon du Parc out of Hilda des Ludes (by Urrachree Breeze) bred by Jean-Marie Franche. 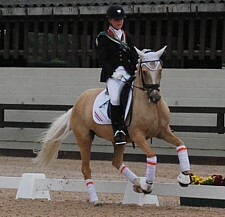 Ridden by Catharina Swartz for Sweden, they were 25th individually of the 48 starters. The Eventing Team and Individual medals were decided over the classic 3 phase event format. The British team were in 2nd place after the dressage then were superb over the tricky XC course to finish that phase 36 points ahead of their nearest rivals, Germany. Classy performances by all team members in the final Show Jumping phase resulted in a resounding victory and the Team Gold medal. Individually, British rider Grace Walker riding Irish-bred Noble Springbok won the Silver medal and all 6 British riders finished within the top 11 places! One of 12 mares to reach the third phase of the Eventing Championships, Catherston Nutsafe, collected both the Best British Bred and the Best Mare Trophies. Nutsafe is a 14 year old bay mare by Catherston Nightsafe out of Catherston Dauntless (by Dutch Courage) bred by Lizzie Murray. 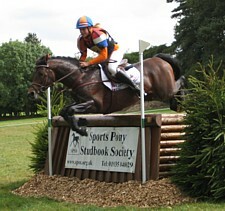 Now owned by Penelope Ecroyd, Nutsafe was ridden by Sam Ecroyd (age 13). Sam and Nutsafe were Team Gold medallists as well as being 5th individually, finishing on their dressage score. In addition to the trophies and a BEF special rosette for the highest placed British bred pony, Nutsafe also received a SPSS Merit Award to mark her achievement as a SPSS Elite Graded mare. These awards were given to all ponies with a SPSS connection competing at the Pony European Championships. The Stallion trophy went to Knock Out, a 9 year old Netherlands Riding Pony stallion by Krimh out of Shannon van de Bossenhoeve (by Diplomat). Ridden by Leontine de Bruin, Knock Out was 9th individually finishing on his dressage score to be the highest placed Nederlamds combination and a key contributor to his team which finished 4th overall. Daisy Davis (age 16), from Bristol, Avon, with Shaun Davis's Future Interest, a 12 yr old Irish bay gelding. Amy Inglis (age 13) from Haywards Heath, West Sussex, with Mandy Hall's Nils d’Hurl Vent a 9 yr old French bay gelding, by Quick Star out of Hera d’Hurlevent (by Boogie de la Gere). Amy is the daughter of British Senior Team rider Duncan Inglis. Jessica Mendoza (age 14), from Chippenham, Wiltshire, with her mother's Tixylix, a 12 year old Dutch chestnut mare. Tixylix is already a double European Gold medallist in 2007 with her previous rider, Zoe Adams, and with Jessica won the German, Dutch and Belgium Grand Prix and Pony of the Year in 2009. 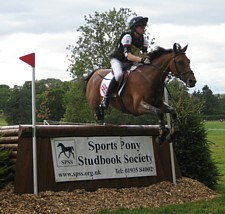 Jessica and Tixylix are the only members of last year's 5th placed Pony Europeans team to also be on the 2010 team. Emily Roe (age 13) from Lincoln with her father's Aroldo, a 13 yr old British grey gelding. Aroldo was on the 2006 European Gold medal winning team in 2006 with Emily's sister Rebecca. Charlotte Fry (age 14), from Driffield, North Humberside, with Mrs R Sherwin's Andexer, a 14.1hh 8 yr old bay stallion by Anjershof Rocky (damsire Wester Aikema's Robert). 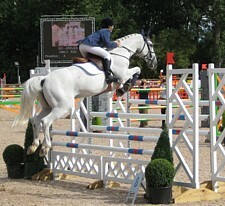 Andexer was sold to Belgium at the 2006 Vechta Spring Elite Auction. Claire Gallimore (age 16), from St Albans, Hertfordshire, with Mrs J Gallimore's Gigolo, a 14.1hh 12 yr old chestnut gelding by Going East out if Nenci (by Nordcap). Claire and Gigolo were members of the 2009 team. 1st Reserve: Roxanne Shipley (age 15), from York, North Yorkshire, with Mrs A Shipley's Best Shakomo, a 14.2hh 13 year old bay gelding by Black Boy. Best Shakomo was a member of Spanish Team in 2008. 2nd Reserve: Harriette Williams (age 13), from Harlow, Essex, with her own Fijal Figaro, a 14.2hh 14 year old brown gelding by Peveril Peter Piper. 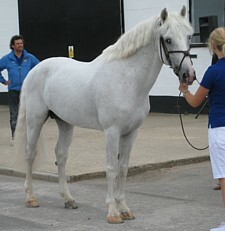 Fijal Figaro is the only British-bred pony in the list and is a pure-bred New Forest pony. Sophie Beaty (age 14), with her own Done And Dusted VI, an 11 yr old gelding by Dusty Box. Alfie Bradstock, (age 16), with Louise Hamilton's Montezuma II, a 9 year old gelding. 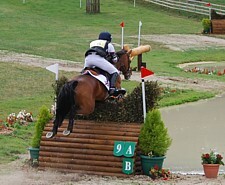 Alfie and Montezuma were selected as individuals for last years Europeans but withdrew after the dressage. Sam Ecroyd, (age 13), with Penelope Ecroyd's Catherston Nutsafe, a 14 year old bay mare by Catherston Nightsafe out of Catherston Dauntless (by Dutch Courage). Catherston Nutsafe is a SPSS Elite Graded mare and was a double team silver medallist with her previous rider, Ella McEwan, in 2008 and 2009. Sophie How, (age 15), with Rachel How's Hotshots, a ten yr old gelding. Harry Humfrey, (age 15), with his own Tantany Torch, a 16 yr old gelding by Vernons Tom Boy out of Burtons Sun. Grace Walker, (age 13), with her own Noble Springbok, a 13 year old gelding by Kiltealy Spring out of Clorogue Lady. Noble Springbok has an impressive Europeans record of individual bronze (2005), silver (2006) and gold (2007) medals and 3 team medals with previous riders Laura Collett (2005) and Libby Soley (2006 & 2007). 1st Reserve: Emily Jane Ryder, (age 15), with her own Mr Moon, an 8 year old gelding. 2nd Reserve: Phillipa Hill, (age 14) with her own A Touch Of Spice, a 14 year old gelding. 3rd Reserve: Pumbaa Goess-Saurau, (age 13), with Susie Goess-Saurau's Killacoran Blue, a 10 year old gelding by Blue Smokey out of Carravilla Rose.